Soak Plank as directed. Dry the plank and lightly coat with oil and sprinkle sea salt onto the plank. You can pre-heat the plank by placing it in the grill for 5 mins. Then place salmon on top. In small bowl, whisk together maple syrup, mustard, salt and pepper and brush over salmon. Place plank on grill over medium-high heat; close lid and cook for about 15 to 20 minutes or until fish flakes easily. Transfer the salmon to a platter and serve. 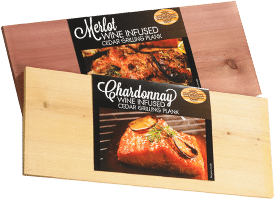 Grilling the salmon on the Wine Infused Cedar Planks gives a delightful smoky taste and the aroma of the wine. Enjoy!